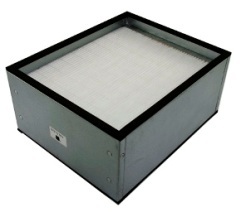  Pleated filter captures 98% of particles 0.3µm in size.  Please Note: The HJ3100 Main Filter (PN: 999-137) has been replaced with the new Hakko FA-430 fume extraction Main Filter (PN: A1586).  The FA-430 Main Filter was designed to optimize filtration and airflow in the smallest volume of space, thus making the FA-430 unit and Main Filter smaller than the HJ3100. If you have a Hakko HJ3100 fume extraction system, the new FA-430 Main Filter will work in your HJ3100 with the Hakko Filter Adapter Frame (PN: 999-241). The Hakko Filter Adapter Frame was designed to ensure a good seal between the lid of the HJ3100 and the smaller FA-430 Main Filter.